When we lived in Seattle, the 4th of July was often cold and rainy. It was normal to drag out long winter coats, gloves, and blankets to keep us warm enough to watch fireworks. Not this year. It's sunny and gorgeous here today, and has been, except for a bit of gray yesterday, since I got here. Seattle in the sunshine is a glorious place to be. There's no time, and little point, in blabbing on about everything I'm doing here. Suffice it to say I'm visiting my kids, Rick's family, and my dearest Seattle friend, eating amazingly beautiful and tasty vegan food, taking nice long walks around Greenlake, and enjoying the perfect weather. 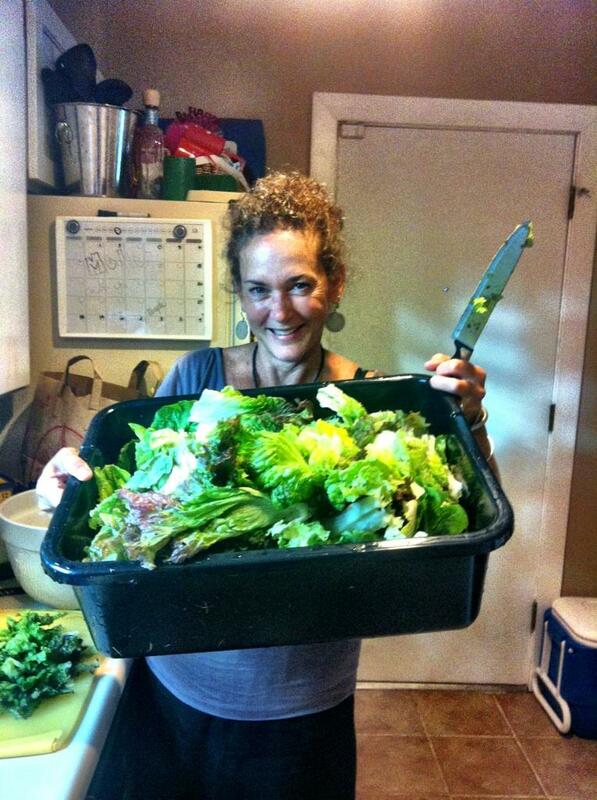 Here I am with some gigantic lettuce from Rick's sister's garden. For the rest of the pictures visit my Seattle album on Facebook. Happy festivities to you! Glad you are having such a wonderful time! !